Will Long Term Rehab Facilities Let You Leave to Visit Family? One reason that committing to treatment in long term rehab facilities is so unnerving is that the addict must say goodbye to close family members. Additionally, this is also a time for leaving home and entering an entirely unfamiliar setting. While this is a necessary part of recovery, it can leave new rehab patients feeling emotional and concerned. They may approach the intake process with misgivings, once they realize treatment will separate them from their familiar and comfortable surroundings. While this separation is necessary, it isn’t permanent. Addiction treatment patients need time to adjust to their treatment schedule and that’s much easier to do without the distractions that family visits can bring. For that reason, most treatment facilities ask family members not to visit their loved ones for the first three to four weeks of treatment. In addition to helping them adjust to a new routine, this period will help the individual bond with other patients, so they can develop a system of mutual support. This will help each recovering addict learn to trust the others in the treatment program. Can I Go Home to Visit Family? One of the most common questions that people ask about long term inpatient treatment is if they will be allowed to leave the facility to visit their families. While each facility has its own rules, it’s not likely that any treatment center will let residents leave the facility. One purpose of inpatient rehab is to limit the individual’s access to drugs and alcohol. Allowing a recovering addict to leave the facility gives him access to controlled substances, presenting opportunities to use before the individual learns to control his cravings. Additionally, the individual may try to conceal drugs and sneak them into the facility to sell to other patients. It’s better to keep patients in the facility until they have completed their treatment program. While you won’t be permitted to leave the facility, that’s not to say you won’t be able to visit your loved ones. After you have been in treatment for a few weeks, your family will be permitted to visit with you. Just like any healthcare facility, the treatment center will have designated days and times for family visits. Usually, visiting is limited to Sunday afternoons. When your family does visit you, the discussions you have with them may seem a little awkward or unusual. This is because your family members will have been advised to be cautious about the things they say. Certain topics may bring up emotional baggage for which you’re not ready, so your family members will try to stick to general small talk for your first few visits. They may also be reluctant to discuss your future, because that can raise expectations that you may not be able to fulfill. You’ll have to get used to receiving compliments from your family members, even if you’re unused to receiving their praise. They want to show you that they’re proud of you for taking this step toward recovery and compliments are the best way to show support. You should try to feel proud of yourself for earning this praise and recognize that you really have come a long way. Above all, enjoy the time you get to spend with your family, even if their visits seem brief. 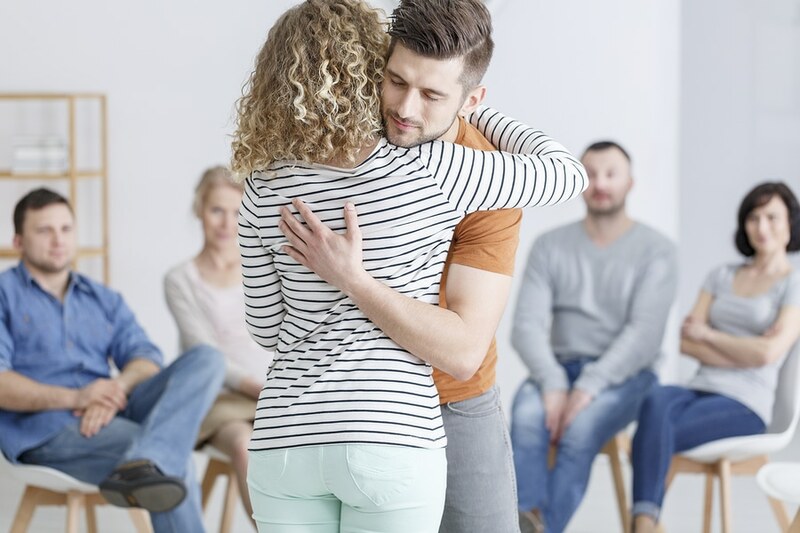 As your treatment progresses, your counselor will invite your family to participate in therapy. This is another step in your recovery, which provides the opportunity to address any drama that was caused by your addiction. While weekly visits were casual and avoided this drama, family therapy sessions will be organized around confronting these problems. The goal of family therapy sessions is to repair damaged relationships. While this may be difficult at first, dealing with family conflicts in therapy will make it easier for you to go home later. Working through the problems you have with your family can be a rewarding experience, helping to eliminate any apprehension you would have felt about returning home after treatment. Whether you want to know more about what to expect in rehab, or you’re ready to commit to treatment, call us at 770-299-1677. Our counselors are standing by 24 hours a day to guide you on your way to recovery. They can even speak with your family, so everyone will know what to expect. When everyone knows what’s involved in the treatment program, the intake procedure and early weeks of treatment are much less unnerving.